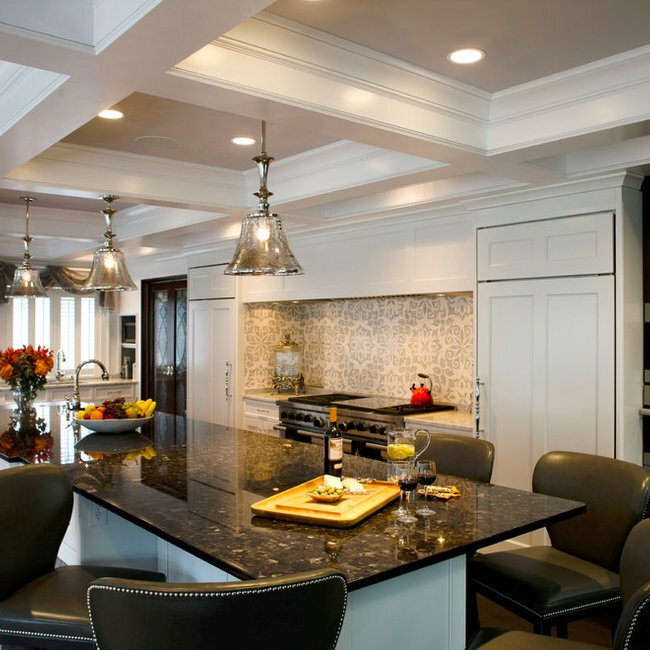 gray/ chrome stools and pendant lights with chains of cut glass "gems" combine to make this Kitchen look much larger than its 16' x 18' foot print. The valances on the windows were designed to make the windows look taller while still allowing a lot of light in not obscurring the view to the outside. We turned a Master Sitting Room in an old farmhouse with virtually no closets into a spectacular award winning Dressing Room with much needed storage. The added plus was a Gallery (in this space traversed daily) for the clients' Bucks County Impressionists' art work. Carpeting by Webster Associates kept the soft feel of the Sitting Room - often walked in stocking feet. 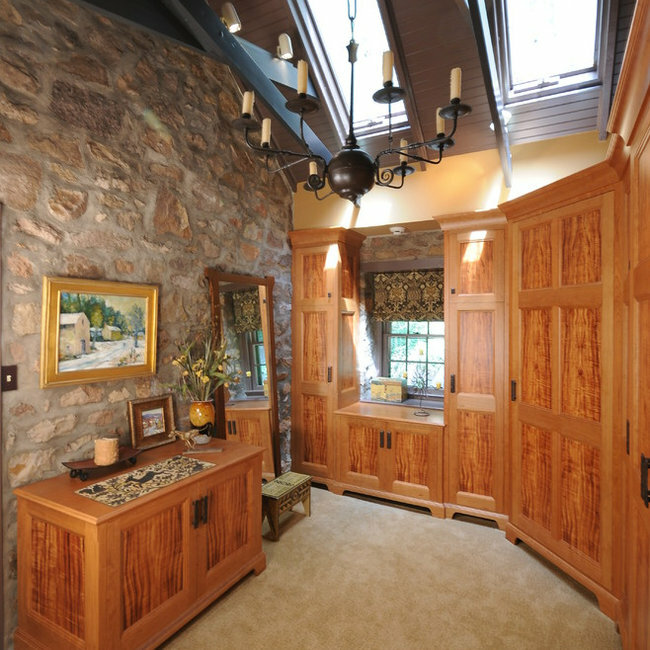 The custom made cherry wood cabinets with Koa wood veneer crafted by William Stowe and hand made hardware, the hand made chair and William Morris fabric combine to make this a Craftsman style gem. 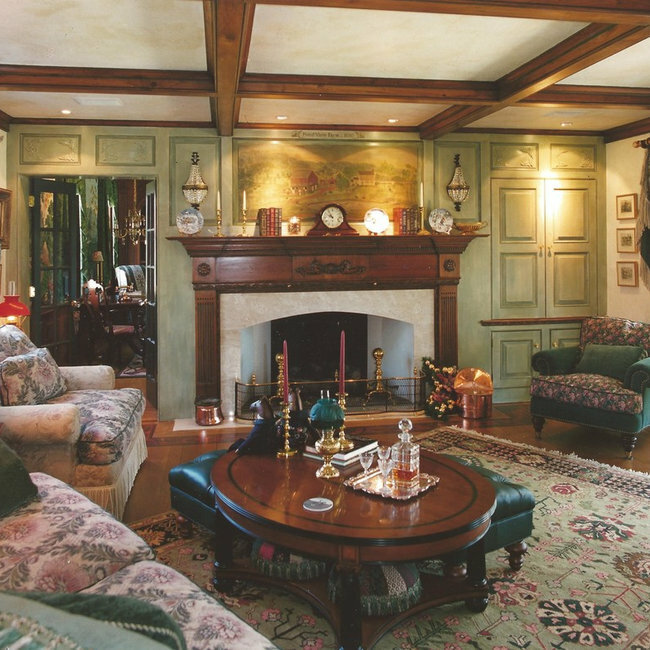 Bruce T. Lesser and son Scott built the homes shown here finished with Linda Daly's interiors. 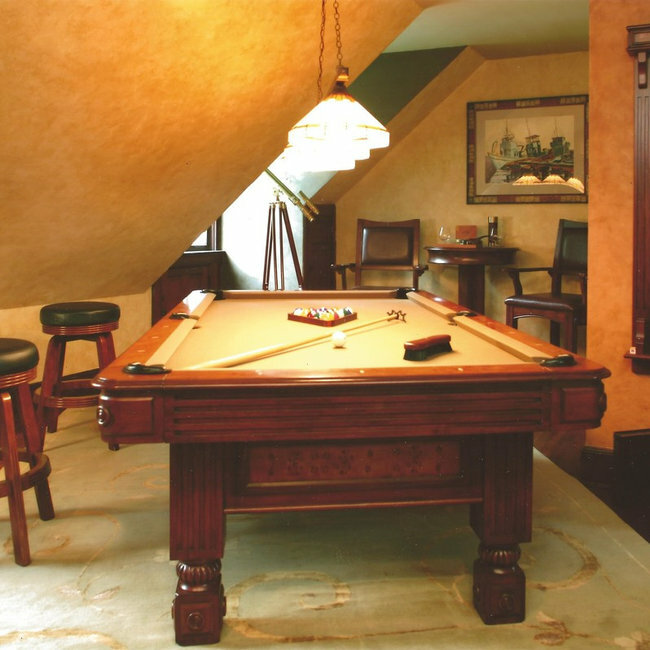 Each interior is marked by the quality of the homes' construction, woodworking and finishing. 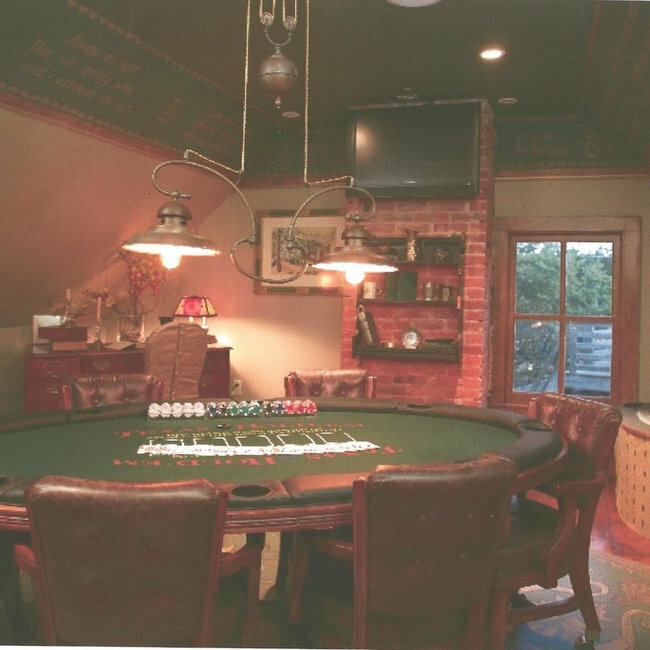 The interiors reflect this same hand craftsmanship with attention to detail. 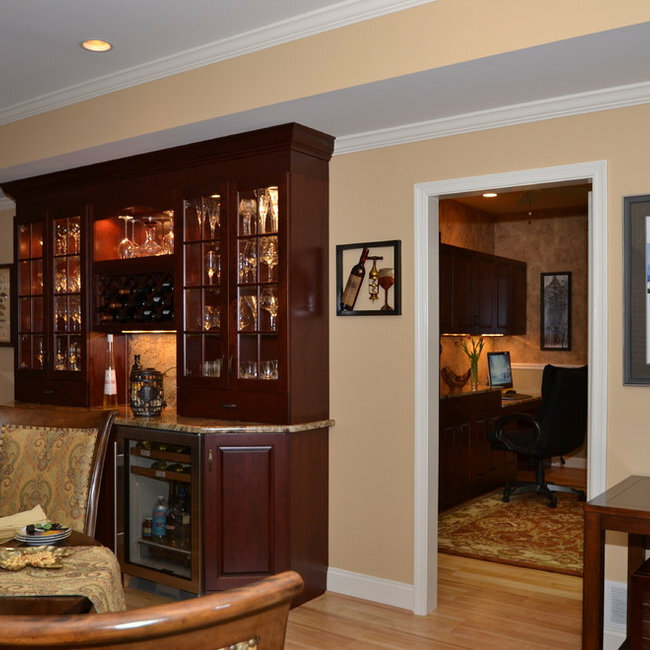 Decorative painting, hand crafted lighting fixtures, custom made carpets and spectacular window treatments complete the design of these homes. Transitional styling of Kitchen, Great Room, Lounge, and Breakfast Room in understated elegance paired with the practicality necessary for a large family with pets. Scale, build quality and market appeal were dramatically improved by an addition, upgrade and overhaul. Removing columns and the separation between spaces while bumping out and enclosing the screened in porch we improved the visual connections, bringing the outside in and the inside out. The Family Room and Kitchen that were small compared to the gracious proportions of the home were now larger and part of the multifunctional living space seating up to 20 comfortably. 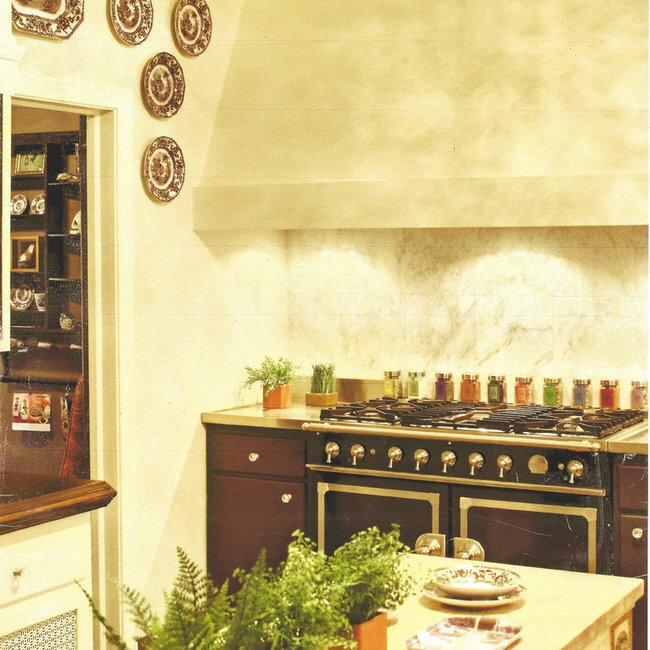 The Kitchen serves avid cooks, teenagers darting in and out, regular entertaining and various craft projects under way. The unique central Lounge with loveseats became a cozy spot surrounded by the Kitchen, Breakfast and Family Rooms. For practicality and easy cleaning the carpets in the Lounge and Family Room are of polypropylene and the one in the Breakfast Room is nylon. All the upholstered furniture is sprayed to help prevent staining. Lots and lots of storage so that the Kitchen is clutter free but everything needed is easily accessed. The gray color scheme is soft and also interesting in the use of texture. The coral accent can easily be changed any time by a change in pillows, art work, and accessories. The space is timeless yet timely. The 38th floor -Columbus Avenue-an apartment designed to entertain and relax in. 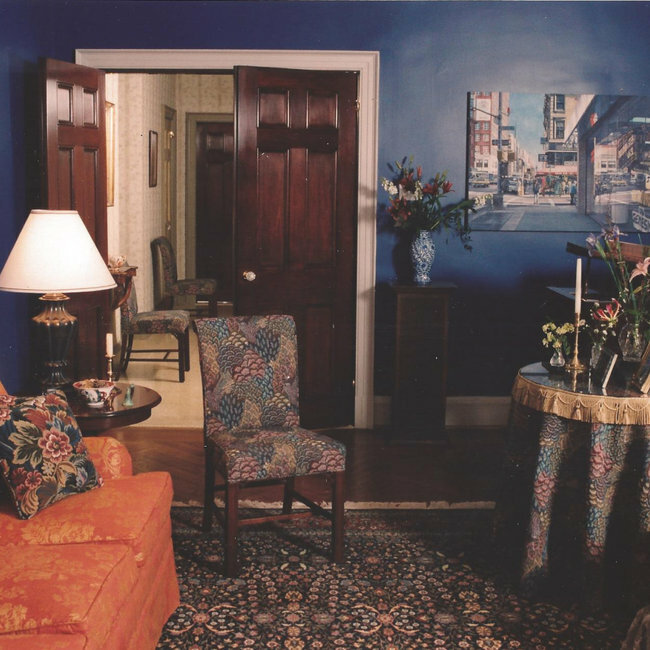 The Foyer floor is painted in a mural depicting Greek actors, a nod to the clients' involvement in Broadway shows. The stools at the Bar revolve for viewing the TV in the Living Room. The rooms are designed to flow in function and finish. 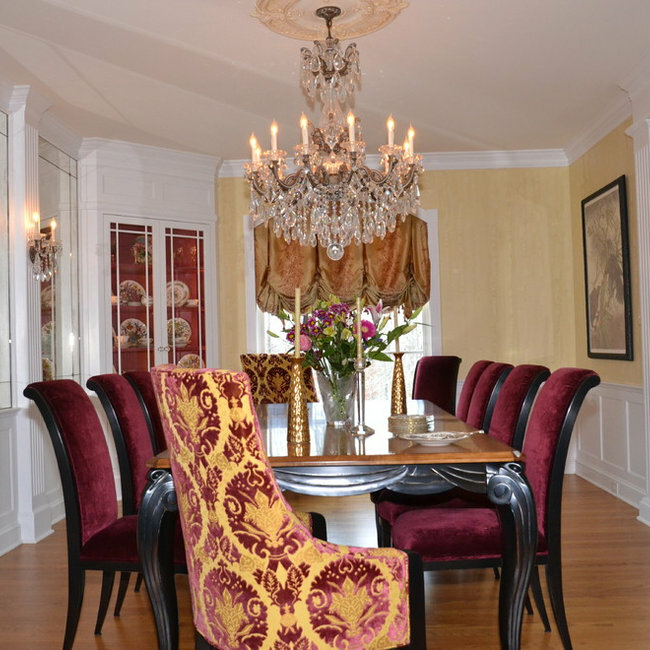 Warm gold tones accented with rich red and blue are the colors used throughout. The unobstructed view over the city is one of the apartment's focal points as well as the fine antique Biedermeier furniture. Bold colors make the Living Room stunning. 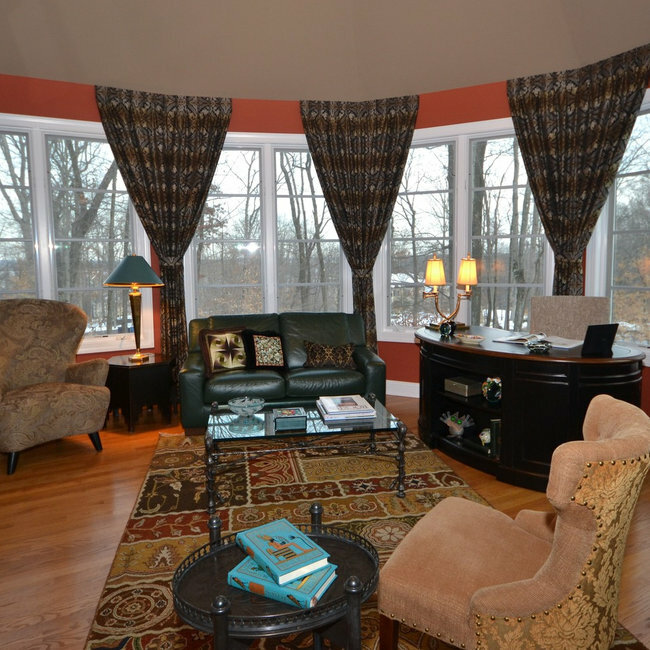 The tapestry fabrics and Oriental carpet make it inviting and comfortable in a more relaxed way. The baby grand piano is often played when entertaining. A Library/Sitting Room that converts to a Dining Room on occasion is a perfect solution in a Manhattan apartment with growing children. Kids can sit on the floor to watch TV and adults can read or sit on a nearby sofa. When a Dining Room is needed the drop leaf table forms the centerpiece of the Dining table and two demi- lune tables are placed at the table ends. The Library arm chairs become host chairs and side chairs from Foyer and Living Room complete the number of chairs needed for dining. 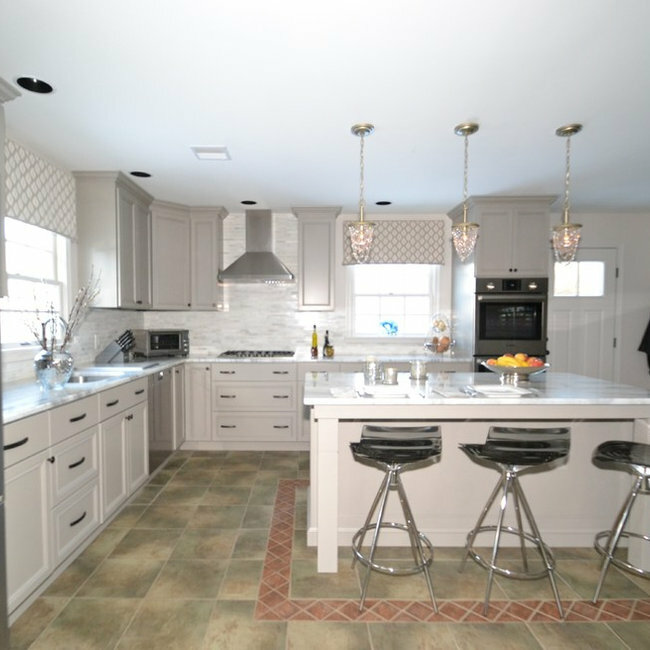 This fresh, light and updated Kitchen makeover in the Junior League of Greater Princeton Designer Show House was achieved by using Farrow and Ball paint, refurbishing the existing cabinets, updating appliances and the addition of a Baker "island". 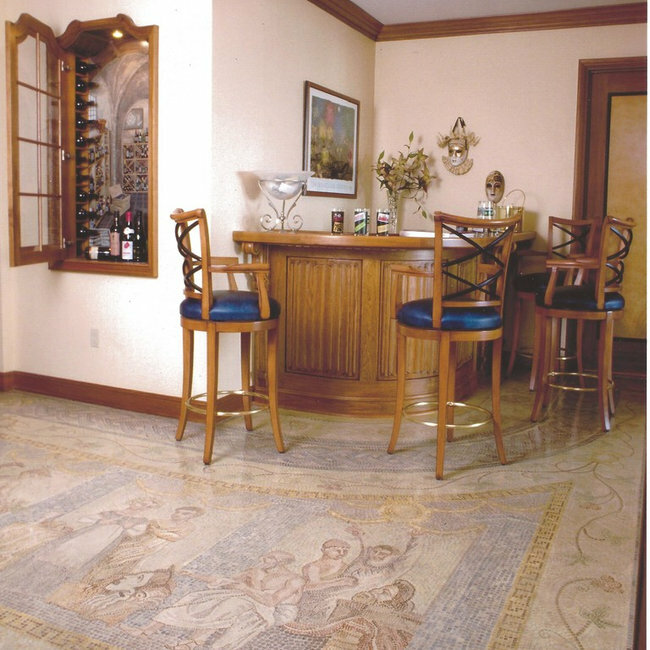 The old linoleum floor was polished and livened up with the placement of an antique Oriental carpet. Antique white with blue transfer plates were hung on the walls in lieu of wall covering. Unique original art work by Carol Nagel hung on the soffit adds interest to the sink area. The Kitchen Study had been a very small Laundry Room. The chocolate colored walls help create an oasis of calm where menus could be planned or Kitchen cooking shows viewed on TV. There's a lovely comfortable chair for reading or relaxing and even a desk (with a disappearing chair) for times when a surface is needed for writing or notebook.